Lets we talk about State Management and take overview of it. It is the common topic in all the technology such as .NET , PHP ,JAVA. It plays an very important role in web technologies.Have you ever check whenever you fill any form and after submit the form all the Textbox or any other control are becomes Empty. WHY? So State Management provide us the Solution regarding the Solution. 1. All the pages are Stateless. 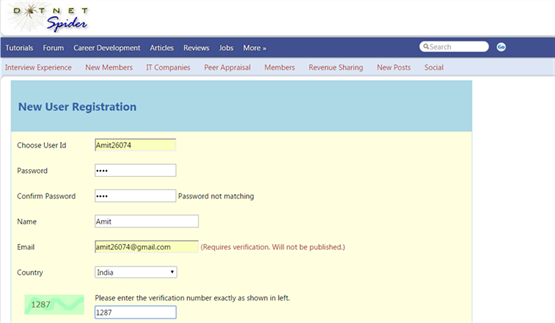 Example : Whenever user fill the details in the form (eg Name ,Email ,Address) and press submit button then request goes to server and new page is introduce with all the empty fields on client Machine. All the controls are empty shows pages are stateless.To Save these details we use State Managements Technique. 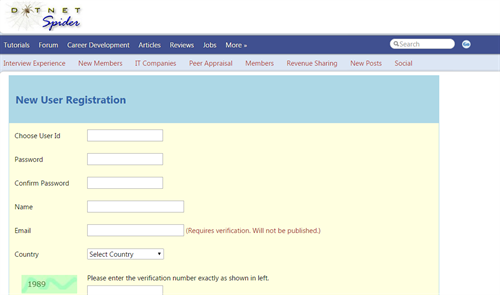 There is an sample of form when I fill the data in the field and press submit button after submit the form on server new page is formed on the client machine and all the field are empty it prove that all the pages are Stateless. 1. Client Side State Management. 2. Server Side State Management. 3. Faster as Compare to Server-Side State Management. Cookies and Query String are common in .NET, PHP, JAVA. Hidden and View State are used only in .NET. 1. Server-Side State Management means to use the server side resource. 3. It is slow as compare to Client-Side State Management. Q. Where Cookies Data Store? 1. Data Store in the Text-File and these Text-File are made on the Client-Side. 2. We can store String values not object. 3. Scope is multiple page or on Current Machine. 5. But we can Create Permanent Cookies. In Permanent Cookies we can specify the expiry day,time etc. 6. Cookies are URL specific. 7. Initial Size of Cookies are 50 bytes. 8. Maximum Size of the Cookies are 4096 bytes or 4 KB. 9. Per Website Maximun Number of Cookies is 20. 10. On Every request Cookies goes to the server and server expire the Cookies. 1. Size of Cookies are Limited. 2. User can easily manipulate the Cookies. 3. User can Enable and Disable the Cookies. 1. In Query String Data Concatenate in URL. In the Above url PostResource.aspx is the page name. ResourceId define the Query string variable Name throug which we can pass the data from one page to another. 2. We can Store Sting Value not object. 3.Scope of the Query String is Next Page Only. 4. Maximum Size of the URL is 2086 Character and it is varies from browse to browser. 2. Not Secure. All the information is display in the URL. 1. Information store in the form of #key,Compressed and encoded form. 2. In view state we can store string value as well as object. 3. We can store any serializable-object. 4. Scope of View State is Current Page only. 5. We can also specify encription mode for view-state. 1. Performance of the page is Slow in case of Large Volume of data. 1. It is Similar to Query String. 2. In Hidden Control we can store String values not object. 3. Scope of the hidden is Next Page only. Now some question arise in our mind then what is the Difference between Query String and Hidden. 1. Generally Query String data is display in the web address. But for security reasons we use Hidden Controls instead of Query String because it's data or information is not display in the Address Bar. 2. But Performance wise query string is best as compare to Hidden Control. This is enough for the Client Side State Management. In the Next Article we will discuss about the Server Side State Management and later on we will do some practical for deep and better understanding the concept of State Management. Feel Free to post the comment. So that I will try to improve the quality of the content. 1.The application state is maintained in the application level. It is common for all users in a application. 1.Session state is maintained user level. It is different for different users. Session maintained in the website process is called Inproc Session. Session maintained out side the website in the state server is called state server session. Session maintained out side the website in the Sql server database is called sql server session. Session is maintained until we delete from the database table.